Viruses can live outside the body. They only require moisture to stay alive. As long as there is enough water to form microscopic droplets, viruses will stick around. In most places, viruses will live for about 24 hours outside the body. In some cases, though, they have been known to last up to a full week. After fight off an infection, you can get sick again days later just by handling your stuff. Porous surfaces disperse water droplets, effectively killing viruses. Viruses can only survive on extremely absorbent materials, like tissues, for about 15 minutes. Couches, upholstered chairs, and bedding are also quite safe from viruses. Hard surfaces, on the other hand, are where the danger is. 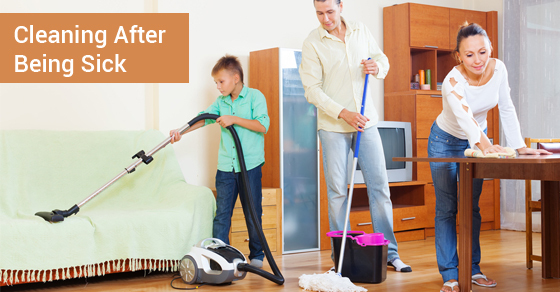 Focus your cleaning efforts on everything in your house that does not absorb moisture. When moisture isn’t absorbed, it creates surface micro-droplets that protect and support viruses. On-off switches for lights, appliances, electronics, etc. Wipe every one of these objects down with the appropriate cleaning product. Household cleaners like to advertise “anti-bacterial” chemicals, but these are often useless against viruses. Anti-bacterial cleaners tend to use triclosan or similar chemicals. Triclosan prevents bacteria from reproducing, so that bacteria colonies die rapidly from old age. Viruses do not need to reproduce; in a water droplet they do not die from old age. Since most diseases are viral and not bacterial, this kind of cleaner will not protect you. So, what will? Strong acids and bases break down a virus’ protein casing, killing it. We recommend solutions of vinegar or bleach when cleaning after sickness. You literally cannot do better than a bleach solution: even World Health Organization doctors depend on bleach to protect them from the Ebola virus! As an added bonus, both bleach and vinegar get absorbed by and cause death in most bacteria and fungus, preventing mold and mildew from developing. If you use the right solutions on all hard surfaces, you can eliminate any chance of being re-infected by touching your own things.